Effective immediately all Project321 rear hubs will be equipped with our new magnetically actuated, 6 pawl, ratchet drive system. This new system gives you a combination of options and features like no other drive system on the market. 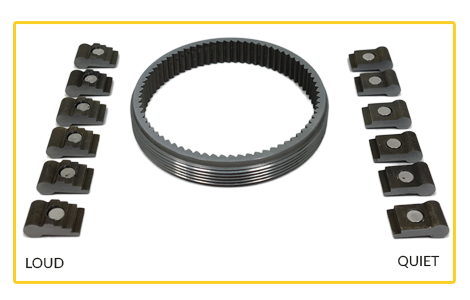 By using magnets as a pull spring (opposed to mechanical or magnetic push springs) to move pawls into the drive ring, we are able to achieve less drag and less noise than other high speed ratchet mechanisms. By using magnets in this configuration the pawl force against the drive ring is at its strongest when the pawl is fully engaged. As the pawl climbs the drive ring teeth during freewheeling the force (and friction) is reduced as the pawl magnets get farther away from the drive ring. This is the exact opposite of traditional mechanical push springs where the weakest point of the spring is at full engagement and the spring force gets stronger (creating more friction and drag) as the pawl is pushed up over the drive ring teeth during free wheeling. By carefully placing the correct strength magnet in the precise location it gives us plenty of force to quickly move the pawl into location as it clears a tooth but minimizes drag and friction during free wheeling. It seems like a small detail that wouldn’t amount to much but our test numbers are showing a substantial decrease in drag. Read below for more detail on the benefits of this new system. Our standard 6×2 driver (6 pawls with 2 pawl engagement) boasts 216 points of engagement (1.66°). You may also choose our 6×3 driver (6 pawls with 3 pawl engagement) and get 144 points of engagement (2.5°). 6×3 system only recommended for tandems, e-bikes, and riders over 275lbs. Both options come with a 3 year warranty. Choose quiet or loud pawls. Through careful pawl design, increased oil capacity and patent pending placement of the magnets that actuate the pawls we are able to produce a quiet ratchet mechanism that is almost inaudible while riding. If you love the louder precision sound of high end, fast engaging hubs you can still choose our loud pawls that have a similar sound volume to the Industry Nine drivers we previously used. Our new drive system with quiet pawls produces 68% less drag than the systems we previously used. Our loud pawls produce 51% less. The only moving parts in our system are the 6 pawls. No mechanical springs to wear out or fail and no tiny springs to shoot across the room during disassembly and maintenance. Just 6 pawls and oil. The magnets are bonded to the pawls. 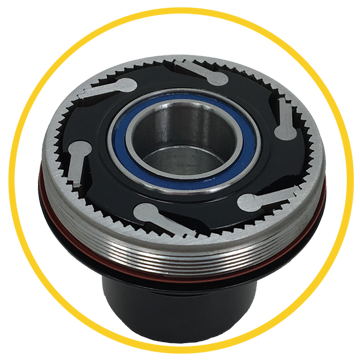 Our hubs are machined with a series of holes in the drive chamber to drastically expand oil volume in the drive chamber. More oil dampens sound slightly but it also extends time between service intervals. Filling this chamber adds 1.5-2g of weight to the hub. During the development of our new driver we kept asking ourselves if we could make any improvements on our current G2 rear hub shell and incorporate those changes into this driver release. So we looked closely at the main things a hub shell should offer. Things like flange diameters and flange spacing that control bracing angles, high quality precision machine work, and mostly, durability. In the end we concluded that we can’t really improve on any of those and with a 0% failure rate on our hub shells and axles (that’s right not one broken hub shell or axle) we decided to make only one change: to extend our hub shell and axle warranty to 10 years. With that in mind we designed this driver to fit our current G2 hub shells. 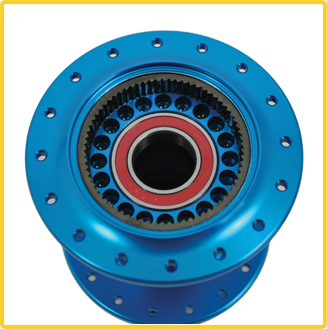 This means our customers who previously invested in our G2 hubs can upgrade to the new new Project321 drive system. 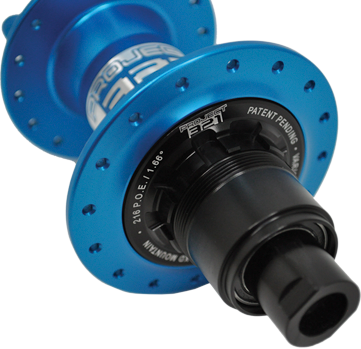 Drivers are in stock and shipping on all new hubs.